Purcellville Town Hall is located at 221 South Nursery Avenue, Purcellville, VA 20132; phone: 540-338-7421. Photo: Rich Bottom Farm, ca. 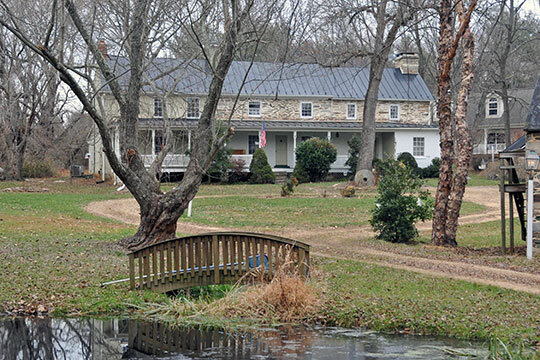 1780-1820, 16860 Hillsboro Road, Purcellville, VA. Listed on the National Register of Historic Places in 1997. Photographed by user:Jerrye and Roy Klotz, MD, 2007, (own work) [cc-by-3.0 (creativecommons.org/licenses/by/3.0)], via Wikimedia Commons, accessed January, 2016. Although the first land grant in the area was issued by Lord Fairfax in 1740, it was not until 1764 that Purcellville's first known settler, James Dillon from Bucks County, Pennsylvania, arrived. As might be expected, it would take a road to make a town; the early ox cart track which wound westward from Leesburg, known later as the "Great Road", served this purpose. The Great Road, now known as Route 7, became an authorized turnpike in 1785 and extended the turnpike system westward from Alexandria to Snickers' Gap, and beyond to Berryville and Winchester. With the construction of this turnpike in 1832, travel through Purcellville began to increase—the first stagecoach arrived in 1841. A railroad link was built to Leesburg prior to the Civil War, and travel to points further west was continued by stagecoach through Purcellville. When the railroad was extended to Purcellville in 1874, the Town took Leesburg's place as the beginning of the stage route until the Washington and Ohio Railroad (later reorganized as the Washington and Old Dominion Railroad) was extended to Round Hill in 1875. The Town's dependence upon transportation links to the more populous eastern Northern Virginia has remained strong. Over the years, improvements have been made to various segments of Route 7, and a bypass highway now connects western Loudoun County to the larger metropolitan area. The first recorded business, an ordinary (a combined store and inn), was established by Abraham Vickers in 1799. This was followed by a second ordinary, established by Stacey Taylor in 1804, and later by "Purcell's Store" and Post Office, established by Valentine Vernon Purcell (from whom the Town's name is derived). A blacksmith's shop, established around 1848, was also among the Town's earliest businesses. The Town's first public school was built in 1883. On July 9, 1852, the village officially adopted the name Purcellville, and on March 14, 1908, the Town was incorporated by an act of the Virginia General Assembly. Although there were several marches and chases through Purcellville during the Civil War, the Town sustained no major damage. However, a series of disastrous fires, the first in 1900 and two more in 1914, virtually wiped out the business district, depriving the Town of much of its earliest architectural heritage. Much of the downtown was rebuilt, and now the early 20th Century downtown is designated as a historic district on the Virginia Landmarks Register and the National Register of Historic Places. Purcellville's moderate growth during this rebuilding period was not indicative of its future growth. Furthermore, Purcellville's traditional dependence upon agriculture as its primary source of income has diminished as more and more residents are employed outside of the community. The challenge is to accept this change without the Town losing its historic identity and those everyday, small-town amenities that have developed over its long history. Located in western Loudoun County, the town of Purcellville, Virginia stands near the foothills of the Blue Ridge Mountains in the center of the Loudoun Valley. The town maintains a diverse mix of residential, commercial, religious, institutional, and industrial properties that characterized it during its historic period of significance which extends from 1830 to 1957. Located approximately ten miles west of the Loudoun County seat of Leesburg, the town of Purcellville stands between the Catoctin and Blue Ridge Mountains in the Loudoun Valley, which is part of Virginia's Northern Piedmont region. Standing at an elevation of 576 feet above sea level, the town occupies a relatively level plain situated amongst the rolling Piedmont landscape of western Loudoun County. Purcellville Planning Commission, Comprehensive Plan, 2006, www.purcellvilleva.com, accessed January, 2016. Kathryn Gettings Smith and Edna Johnston, History Matters LLC, Purcellville Historic District, Loudoun County, Virginia, nomination document, 2006, National Park Service, National Register of Historic Places, Washington, D.C.